Tabletop Simulator by Berserk Games is less of a game and more of an enabler for many games. 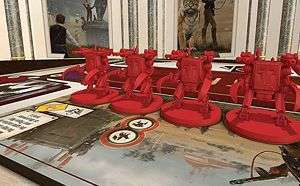 Generally speaking, if you want to play a physical tabletop board game, you are going to need to gather a group of people together in the same place and sit down to play. Brilliant as the event may be, the actual realities of organising any group of people together is usually a stressful and drawn out process with no guarantees that everyone will be able to make it on any given day. Enter Tabletop Simulator (TS), which just simply provides you with a sandbox-style virtual table and a physics engine on which to play pretty much anything you want, either with your friends or with other random people from the internet. The “game” itself comes with about fifteen classics such as Chess, Poker, Dominoes, and many others. However, the real brilliance of TS lies in the user-created content that is available via the Steam Workshop. 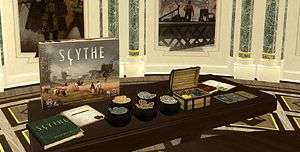 Practically every tabletop or board game you can think has been converted, in some way or another, into digital form and can be played within the simulator for free. In all fairness, the quality from game to game can vary massively. However, thanks to the rating system built into the Workshop, it’s very easy to sort the wheat from the chaff. It should probably be noted that most, if not all, of these adaptations are unofficial, and I couldn’t tell you if permission has been given from any of the licence owners. However if this does bother you, some games have their own official adaptations that can be purchased as DLC. For those who want to play games that aren’t available via official DLC but have been made by fans, I don’t think there are any legal repercussions for playing the unofficial versions. Steam doesn’t appear to allow content creators to charge for these games, so there may be some legal loophole regarding fair usage and the like. As well as these adaptations, TS allows you to create your own games using its powerful tools to add your own 3D models and your own unique cards. Berserk Games have a selection of excellent tutorials on YouTube to help you with this, however I’m not really the creative type and haven’t tried to make anything myself. In terms of playing the games themselves, your cursor acts as a hand and allows you to pick up and move objects such as playing pieces, cards, tokens, and the like. Further keyboard commands are then required to do other things such as flip cards or rotate pieces. Players can then use the WASD keys to fly around the board and also zoom in to get a closer look at things on the table. Hovering over a card and pressing the Alt key will also display the text front and centre on your screen. I didn’t realise you could do this at first, and until then had been flying around the board trying to position the camera so I could read cards and the like. Overall the control system works quite well, although it can sometimes be fiddly if you have a lot of pieces all over the board that require a degree of accuracy when moving. Also, as you only have one mouse cursor, it’s a bit like only having one arm – you will undoubtedly find yourself unintentionally knocking over other game pieces from time to time. This is a minor annoyance though, and you can rewind the table state to correct any major mishaps. TS also provides powerful admin controls which allow designated players to lock down pieces and prevent other shenanigans from strangers who may want to ruin a game for everybody. It also allows for secret areas in which only you can see what is going on. This is handy for looking at your hand of cards and such in secret before playing them. Visually, Tabletop Simulator looks good, but is also basic enough that it will run comfortably on most machines including those with older graphics cards. The pieces and cards will vary in quality when playing user-created content, however the highly rated games tend to have very good production values. In addition to the actual games, TS allows you to play on a large number of different tables set within various environments ranging from cosy rooms to outer space. Berserk Games have done a very nice job with this and, for the most part, your computer shouldn’t even break a sweat while doing it. With regard to the audio, all the pieces, chips, and cards make the expected noises as they are moved around, clinked together, or flipped over. I especially like the sound a bunch of dice make when thrown across the table. There isn’t much going on in terms of music, excluding the music played when you first boot up the game and are navigating through the menus, but TS does give you the option to play your own music while playing the game. I see this as a good thing as you’re going to get sick of any repetitive music when playing long sessions, and the lack of music won’t get in the way when using the built-in voice comms or any other VoIP software you may be using in the background. 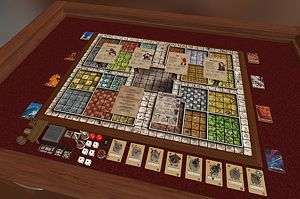 As I mentioned at the beginning of this review, Tabletop Simulator isn’t really a game as such, and everyone’s mileage out of it will vary. As a fan of board gaming, I’m finding it very useful for trying out different squad builds for the X-Wing miniatures game before buying the expensive miniatures. Same goes for trying out other games which I’m interested in buying but am not 100% sure about. It also works great for playing with friends who can’t always meet up on a regular basis but who are able to find the odd hour here and there to play a quick game or two. It’s also great fun to flip the table and see the pieces go flying everywhere if you lose! In addition to all of the above, TS has also recently added a VR mode which, when used with the Vive motion controls, allows you to use both hands while moving things around. I look forward to trying this out in the future. Dubious copyright situation regarding unofficial games. Overall, I really like Tabletop Simulator; as an avid board gamer myself, it’s perfect for trying out new games before I buy them, as well as playing games I already own with people far away. The access to the Steam Workshop is what really makes this worth owning. Yes, there are some questions to be asked regarding copyright and whether or not some of these unofficial games are being pirated or not, but I’ll leave you to form your own opinions on this and act accordingly. I’m not your real dad. However, if you enjoy board games I can’t recommend Tabletop Simulator enough, and you should pick this up as soon as possible. Slight control niggles aside, this is the closest you are going to get to playing a board game without physically playing one. The addition of a VR mode is only going to improve the experience and I’m really looking forward to trying this out when I finally make the leap into VR.